The Sunray Shadow Yellow is one of the Sunray Shadow series of flies. It is an extremely simple and versatile fly that is extremely good at catching fish. It is successful whether swinging high in the water, briskly crossing the current towards the bank, skating temptingly across a pool or simply allowed to play in the eddies and swirling currents that moving water creates. Plastic or aluminium tubes, 1/2"-2". Under wing : Yellow buck tail or squirrel. Over under wing : Peacock herl. Main wing : Streamer hair, natural sheep wool dyed black. Black goat or black arctic fox can also be used. Over main wing : Crystal flash. 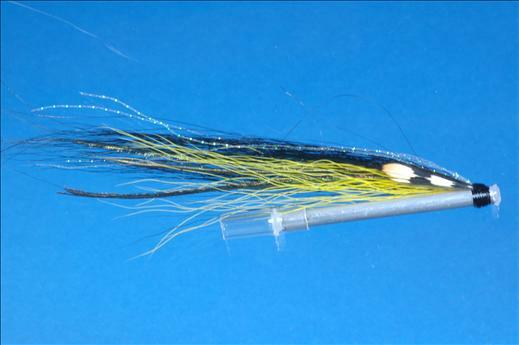 Currently there are no comments about the Sunray Shadow Yellow fly pattern from other fly fishermen yet.